I have started a new podcast called The Pod - I'd love you to have a listen and tell me what you think! Mr Science Show is not gone though, it will continue on boldly! The Pod is about ocean swimming - there is more to ocean swimming than swimming in the ocean - and will cover a whole spectrum of topics. It is likely to be a very sciencey show! So here's Episode One, which is a science-based episode on flesh-eating sea lice. For more information, please check out the notes over on The Pod. A few weeks back, I had a great chat about birthday mathematics with Glynn Greensmith on the It's Just Not Cricket show on ABC Radio. It was great! We discussed how when you are born in the year influences your latter life, some counter-intuitive probabilities regarding shared birthdays, a bit of astrology and whatever else popped into our heads. The audio belongs to the ABC - see here for more on the show. A while back I posted a largely ridiculous idea to create a financial market around cricket one-day international scores. 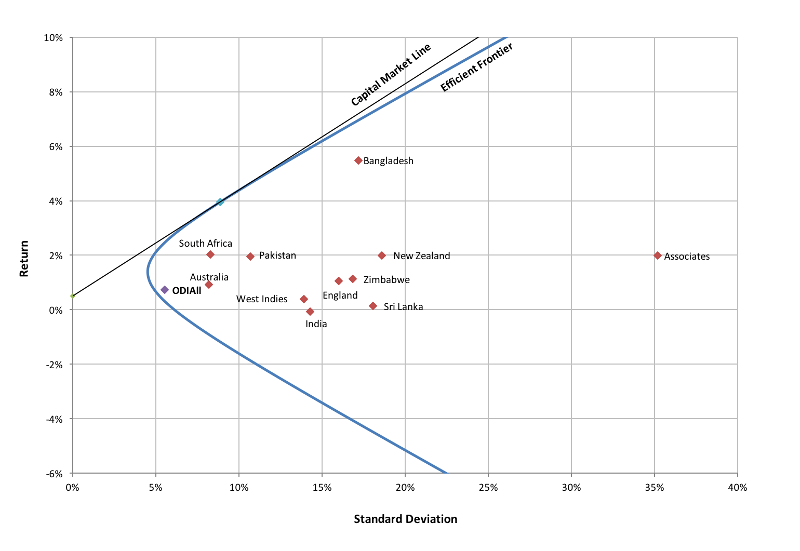 In summary, the "stock" was a team's average score in ODIs throughout the year (with some assumptions, see the post). It was based around the idea that ODI scores have been increasing year-on-year since ODIs were invented. Using traditional financial market modelling techniques, we came up with an investment strategy for each of the teams, which involved mainly investing in South Africa and Bangladesh. So, how did we go? Unsurprisingly, not that well! Under the assumptions of the model, the average ODI score increased slightly from 266.8 to 267.5. So, if you had invested in the ODIAll index fund, you would have made a slight profit. If however you had chosen the market portfolio, you would have lost 14.4% of your money, largely on the back of diminished South African and Bangladeshi performances. Similarly, if you had not allowed short selling, you would have lost 9.8% of your money. And even the least risky minimum risk portfolio lost 4.8%. Much like the real stock market, you best bet would have been to simply invest in the Index. Here is the updated risk/return chart. If you are playing again in 2017, your strategy is similar to last year - perhaps reflecting that this method of measuring "stock performance" is not particularly good! Using a team's entire history to predict next year's scores is not the way I'd do it - you're better off looking at its recent history, who and where it is playing this year etc. I'd probably be investing in England in 2017. They seem to be finally learning how to play ODIs, although they had a very good 2016 so it would take an even better year to improve on that. And the Associates are getting better and better, with 3 set to join the 10 Test playing nations in a proper regular ODI league - they will be jostling for those positions so I expect performances to improve.